Learn how and why to use the modes in this lesson. They’re as easy to play as the major scale, but you need to know how they work to play them correctly. This lesson will give you everything you need to know about the modes! The key to playing the modes is your note selection based on the chord that is currently being played. Keep this in mind throughout the entire lesson. Modes can be derived from the major scale and contain the same exact notes. Why learn a new name for the same set of notes? The main reason is to help you focus on the tonal center of the chord instead of the tonal center of the scale. This shift in thinking will help you unlock new sounds. It will also help you play over ANY chord, even those obscure ones that pop up. You want to be able to improvise over any chord. Your improvisational ideas sound the same and you want to break out of that rut. Doesn’t that sound useful? The good news is that the modes are as easy to play as the major scale. In this lesson, I’m going to show you the two ways that people learn the modes. In my opinion, the best method depends on how you learn. I’ve heard passionate arguments for both, so I will provide both. How Modes Work – Very Important! Before we talk about modes, we must talk about harmony, because learning modes is all about the interplay of the harmony (chords) and the mode. To fully understand the modes and to use them correctly, you must know this theory. Most mode lessons confuse people because they skip this information. If you don’t have a strong understanding of the major scale, keys, chord construction, and diatonic harmony, you may want to purchase Guitar Lesson World The Book which covers all these topics (including the modes and much more). Playing the modes is easy, but understanding them takes a good working knowledge of music theory. Diatonic harmony is about knowing the chords that come from a key. Most songs are written in a key. Keys have a tonal center, or tonic, which the harmony will gravitate towards. Chord progressions within a key are considered diatonic chord progressions. They contain chords which only use the notes of the key. There are a few more things to know, but let’s make sure we know enough about keys and diatonic harmony. When you play in the key of C, the chord progressions gravitate toward a C major chord. In other words, when you play a C note it feels like the song is done. It relieves all the tension. To learn this feeling, play the following chord progression C-F-G. It should sound unfinished. Now play C-F-G-C. It will sound finished. This is what I mean by gravitating or resolving to C.
The key of C uses the C major scale, which consists of 7 notes: C, D, E, F, G, A, B. Each of these notes map to a degree of the scale, which is a roman numeral indicating the order within the major scale. I=C, ii=D, iii=E, IV=F, V=G, vi=A, vii=B. You’ll notice that I capitalized some of the degrees and left others in lower case. I’ll explain this later. Each degree also maps to a particular chord. If you use only these chords, you are playing a diatonic harmony or a diatonic chord progression. You will notice that the upper-case numerals use major chords and the lower case numerals use minor chords. The vii is diminished, which includes a b3 (minor third) so it is also lower case. It is called diminished instead of minor because it also has a flatted fifth. Every note within a key maps to a degree of the major scale. Every degree also maps to a set of chords, which use the notes of the major scale. You can also have chord extensions like seventh chords, ninth chords, etc. I will cover those later in this lesson. This is where it gets interesting. Each of the 7 modes map to the same degrees as the chords mentioned above. You learned that diatonic chords all gravitate toward the tonic (I chord). When you play a chord, the notes within that chord gravitate toward the root of the chord. You have two gravitational pulls. Modes help you highlight the chord’s gravity. The feel changes because of the harmony it is played over. In other words, the chord progression relates to the song’s gravity. The mode relates to the chord’s gravity. When played properly, it will highlight the chord and its harmony. I will go over how to play them properly later in this lesson. The chord progression relates to the song’s gravity. The mode relates to the chord’s gravity. Below, you can listen to each mode played note by note over the matching diatonic 7th chord. The chord will repeat every measure. The mode will start in measure two and play all the notes plus the octave. Starting with measure 2, I play one note of the mode per measure. All the notes should sound good, but some sound better than the others. Let your ears tell you the best notes. It should change from mode to mode. Listen a few times to see if you can pick them out. If you didn’t figure it out, most people think the chord tones sound the best. In each of the modes above that is the 1st, 3rd, 5th, and 7th notes of the mode. For example, Dm7’s chord tones are D, F, A, C. Those notes probably sound the best over Dm7. We want to play the best notes. Because they change from chord to chord, we need to use modes to help us use the best notes! All the notes are good, but the best ones change with the mode. This is why we need the modes! Although the feel of the modes is personal and based on note selection above all else, Modes are sometimes related to a certain feel. I listed some descriptions. Play a mode over a progression and see if you can pick out similar qualities. Let’s review the theory you learned in this section before I continue. 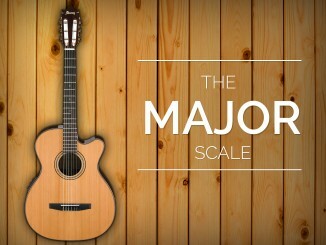 The key, major scale, degrees, chords, and modes are all related. Notes in a chord gravitate toward the root of the chord. Modes, played properly, highlight a chord’s harmony, or gravity. Modes are needed to play the best notes for the current chord! Modes are taught in one of two ways, in series or in parallel. When learned in a series, you will learn all the modes in a key. When learned in parallel, you will learn all the modes that start from the same note. Both are useful to know. You learned that the modes relate to the degree of the major scale. Now you will learn that the modes use the same exact notes as the major scale. They are remembered by their tonal centers, which are different than the major scale’s tonal center (except Ionian). They’re actually shifted. The table below shows the modes in a series as they relate to the key. One method of playing the modes is to use the major scale (and its patterns), but select your notes based on the mode shift. I’ll discuss the patterns later in this lesson. Modes should not be used like a scale, rather they should be used as a framework to find the best notes for the given chord. The selection of notes is a key point that you should not forget. If you don’t highlight the better notes of the mode as they relate to the chord, you will not get the feel of the mode. This method doesn’t tell you much about that, which is why some people dislike teaching the modes this way. If you don’t highlight the notes of the mode as they relate to the chord, you will not get the feel of the mode. Another way of learning the modes is in parallel. This means that you forget the key and learn modes that start from a single note. For example, C Ionian, C Dorian, C Phrygian, etc. To do this, you must know how to modify the major scale to form the desired mode. Learning modes in parallel is great for two reasons. You only need to know the current chord in the progression (so there is no need to worry about the key). The modal differences are more obvious because you must modify the major scale. This can help you play in a way that gives you the proper feel. You can combine the table above with the chord construction formulas to determine the seventh chords that can be played over the modes. Major chords follow the formula 1-3-5-7. Both Ionian and Lydian modes contain these notes; therefore either mode can be used. Minor chords follow the formula 1-b3-5-b7. Dorian, phrygian, and aeolian all contain that formula, therefore any one of them can be played. Dominant chords use the formula 1-3-5-b7. Only the Mixolydian mode flats the 7th without flatting the 3rd. (1-b3-b5-b7). The only mode with a b5 is the locrian mode; therefore it is used over diminished and min7b5 chords. I just made a big implication. These 7th chords are part of diatonic harmony too. They are noticeable when you discuss modes in parallel along with chord formulas. The table below expands on the diatonic chord options we discussed earlier. You’ll notice that we added chords but some modes are played over the same exact chords. For example, the ii, iii, and vi degree modes can be played over the same chord types. In the next section, we’ll discuss some chord extentions which will differentiate these even more. When using seventh chords without extensions, use the following chart to find a compatible mode. If a major chord uses an 11th, use Ionian over Lydian since the Lydian mode has a sharp 11 (or 4th). For all dominant chords, use Mixolydian. If the minor chord has a b13, play aeolian or phrygian. If the minor chord has a b9, use phrygian. Chord extensions are advanced harmonies. If you’re new to modes, remember that the mode options go down as the chord complexity goes up. Once you’ve mastered playing over seventh chords, you can be more selective with chord extensions. Mode options go down as the chord complexity goes up. Before moving on to the next section, which goes over all the modal patterns, let’s review what we’ve learned. Modes in a key use the same notes as the relative major scale, they just start and end differently. Modes can be learned in parallel by modifying the major scale. The mode to use over a chord can be learned by knowing how to form parallel modes. As chord complexity goes up, mode choices go down. Finally, I am getting to actionable part of the lesson. Make sure you fully understand the theory above. Without it, modes will not feel useful. The good news is that modes are often a rut-breaker because they enable you to play in new and exciting ways. Determine the degree of the mode you wish to play (example: Dorian starts on the 2nd degree). Use the degree number as the root note of the chosen pattern. To apply the modes in parallel to patterns, we can take the two basic single-octave major scale (Ionian mode) patterns and modify them for each mode. See the table below for the two basic patterns for each mode. You can combine the two patterns to create a box pattern or to create a diagonal pattern. Practice moving these patterns to other string sets (don’t forget to shift the pattern when you use the 2nd and 1st strings). I know this was a loaded lesson. 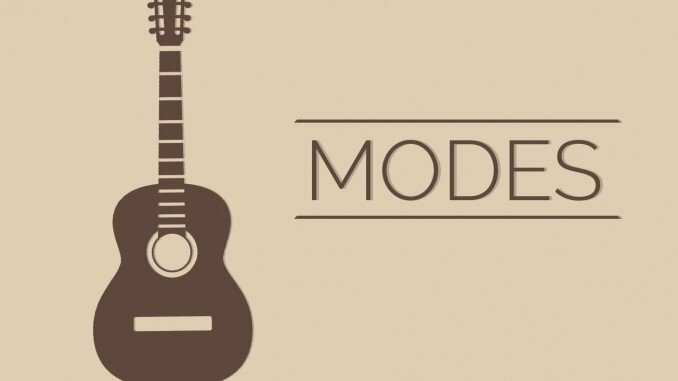 Modes are easy to learn from a pattern standpoint, but have a lot of depth in their usage. Take your time to play and listen to the notes you use as you play the diatonic progressions. This is the only way that you will truly learn to use the modes effectively! The modes concept is far from simple to me and a lot of information to ingest but I’m hoping that over time the knowledge will clarify and improve my improvisational skills. This lesson is very well written put together my thanks to the author. Thank you for the kind words! I recently updated this lesson, so I’m happy to get positive feedback. In the coming weeks, I will be releasing updates to several others. Keep checking back! Thank you for being a teacher with absolute lots of knowledge and patience. Your lesson is well written, although I lost you on choosing the boxes. Could not find the relevance to any of the starting positions. However, I am so pleased that I came across your page, as I have had too many problems with – AND – explanations around scales, that this was a real blessing to my little island. Thank you once again! Pieter, Thank you for your comments and kind words. Contact me using my contact page and I’ll try to answer your questions about the boxes. Hopefully, I can answer your questions and improve that section of the lesson for other readers too. I remember I used to read these blogs and not understand anything! But I was determined to learn the modes. I took about 4 or 5 private lessons on modes, and a friend showed me how chord harmony works, the rest is history. Now it all makes perfect sense, it’s all very simple really after all. I not only use modes now, I compose, do solos up and down the neck, i use the intervals for arpeggio/chord options, it’s really given me so much more than I expected! Endless options, confidence, better technique, better everything lol! I’m so happy I stuck with it until the modes made sense! I was just looking over this blog here for some review and remembered life without modes! and the confusion I had. If this stuff is new to anyone here reading this, stick to it, don’t give up until you got it nailed you will be so happy trust me! Joe, I loved reading this comment. It is encouraging to anyone who wants to read the modes. Almost everyone is confused by the Modes at some point. My first exposure to modes was a scales/modes book that gave me a box pattern and a chord to play over for each mode. I’m glad you mentioned chord harmony and it’s relationship to the modes. That is so important to learning why the modes are useful. Thanks again for the great comment! Sahil, Thank you for the kind comment. I am glad that my lesson on modes has cleared up some confusion. Good luck with your playing! Yes!! A very well written article …thank you very much, Patrick. I learned the modes a long time ago, but I often seem to get myself into trouble using them!!! The article that you have written here helps me understand what I’m doing wrong. Thanks again! Thank you so much for your kind words. I am glad that I could help with your playing. Very well organized, well-written, comprehensive. Thank you for your clear concise and easy to understand approach. Yet I’m confused about one point, for example, if I’m playing a C maj chord, can I play any of the modes over C or is it more like if I play a C chord I could play Ionian and Lydian over it. Or playing Cmin , I could play Dorian, Phrygian and Aeolian etc. If you are playing over a C major chord, I would play either C Ionian, C Lydian, or C Mixolydian. The chord tones of a C major chord are the 1st, 3rd, and 5th note of each of those modes. One of the beauties of using modes is learning that the chord tones are easy to identify if you know the mode. This shortcut will help you play more efficiently! This lesson on modes is by far one of the best two lessons on guitar modes I’ve encountered (the other clearly-explained lesson was written by Matt Warnock, which can be found on Guitar World’s website). Patrick’s version also clearly explains how to apply the modes, which is the whole point of learning modes. Thank you, Patrick. I am humbled to be mentioned in the same sentence as Matt Warnock. Thank you for the kind words. When a musician talks about gravity, it refers to a feeling of resolving tension or dissonance into consonance. The tonic is the chord that will most likely give a feeling of consonance (or relief) after playing another chord from the key. In a different way, a mode will sound consonant over a particular chord. In the section, “Listen to the Modes”, “It should change from mode to mode.”…what specifically is “it” referring to? The notes that sound best over the chord should change from mode to mode. This is due to the interaction of the chord with the note you’re playing. Your comment, “Mode options go down as the chord complexity goes up.”…does this mean that there are fewer Mode options available using extended chords? 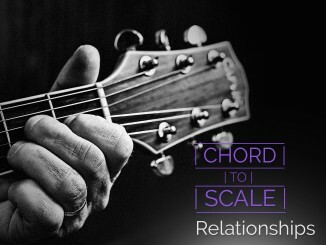 Yes, extended chords use more notes, so fewer modes contain all the extended chord’s notes. The section, “Mode Patterns in a Key or Series” – has me completely baffled here?! Mode patterns in a key refers to modes that use the same notes. In the key of C, that is C Ionian, D Dorian, E Phrygian, etc. Modes in a series are modes that use the same root note such as C Ionian, C Dorian, C Phrygian, etc. The patterns I provide should help you learn either way. I hope this helps. Thanks for this lesson. I’ve read a few on modes and found it confusing but this was explained very well. Thank you for the kind words! I’m glad you enjoyed the lesson. Amazing explanation thank you for your time and your excellent job ! It shows that you know very well what you are teaching !!! A practical question though … lets say I play in E major scale and I meet a F# minor chord can I play prhygian mode on it ? If yes the G that will appear is in opposition with the G# of the scale …is this right ? Or is it used generally ? You are correct, you can play F# phrygian instead of F# dorian in this instance. You’d be playing a parallel mode, but since you’re out of key at least one note will be out of the key. Be aware of what you’re playing and you may find a great way to use those out-of-key notes! 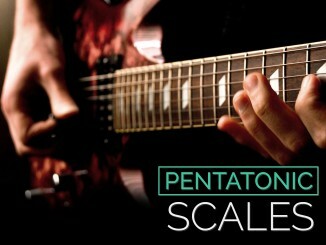 This online lesson helped me a lot with the basis of modes and scales. I was wondering if for example I were to play a C ionian (Major) scale over a D minor chord would I be playing in D Dorian mode? Yes, you would be playing D Dorian, but the key is how you select notes. Do you play lines based on the D note or the C note of the scale/mode? A dorian mindset would focus on D, while an ionian mindset would focus on C (in your example). If the minor key is a modal form of the major key, are there keys based on the other modes? That is to say, is the diatonic series also relative? Or rather does the feeling of tension-resolve from the tonic, subdominant,and dominant only work with the major and minor (Ionian and aeolian) modes? Thank you for the question. First, I view keys based on their key signature (the number of flats or sharps without modifying any notes). That is the set of notes in a key. Generally, it isn’t useful to name a key differently than major or minor. However, if you said you’re playing D dorian, you’d imply the key of C, but you’d probably play the chords as if they were relative to D dorian. I recommend playing the I, IV, and V chords of a mode and judging for yourself. In my opinion, the diatonic series can be applied to the modes. While this article has definitely helped me understand modes (I think), the section on series and parallel don’t fully make sense to me. I think a few examples (such as you can play this… or this…) would really make the section become fully comprehensive. As I think I understand it, just basically play the triad (or extension) within the chord being played, but don’t stray from the arpeggio being played. You mention to not stray from the chord tones. Will playing other notes of the mode scale not work on the chord being played, or is this just to avoid the notes that clash in the scale? Is my understanding of modes correct? Thanks for the article, btw. I think I get it :). I understand what you are saying, but I don’t understand why it matters. It seems like modes are an explanatory fiction. In key of C, when you play an Em chord, a chord in the key, you could just keep playing the C major scale with the extra awareness that you are playing over an Em chord, and therefore you should play more around the notes in the chord. It’s the same C major scale notes, all that matters is how you pick them to play from one chord to the next. What gives it the atmosphere of the mode is the chord under the scale tones and the fact that you keep returning to a note other than the tonic, in this case “e”. I know I will look back and laugh at this someday, but this is where I get stuck in thinking about it. I hear tell that by thinking of it as a different scale it leads you to different ideas. I just don’t see why it should. Thanks for sharing your thoughts on this. In many ways you are correct. It is simply a tool that you may or may not need, but it is one that can make you think, play, and communicate more efficiently. When playing guitar, you can learn the simple rule that works but takes longer to apply, or you can learn a more complicated rule that is easier to recall and communicate. How long does it take to think in C major but shift the notes based on the chord?. If the chords progression goes out-of-key, how hard is it to find the scale or mode that you want? When discussing what you’re playing, how hard is it to explain that you’re playing off the 2nd of C major versus playing D Dorian? My point is that you don’t need modes, but they’re a useful tool that can help. I have one question if you dont mind me asking… I learned all 7 mode shapes 3 notes per string. I have the shapes memorized. However, if I am playing in g major and want to solo over the minor 2nd Am, do I start on the root of A and play any one of the minor shapes ( dorian,phrygian,aeolian,) or do i play the shape that corresponds to that note in the major scale? For instance in the key of G major the phrygian shape falls on a B and aeolian on an E. Do i just play that scale pattern from that note, or do i have to start on the root of the chord im soloing over? Ive often thought in the key of g major that you have g Ionian, A dorian, B phrygian, C Lydian, D mixolydian, E aeolian, and F# locrian. I feel like I’m understanding this wrong. Great layout. Thank you for your time sir. This is a great question. The guitar is complicated and we need to have ways to process the information as quickly as possible. Modes are one of those tools. The answer depends on what helps you the most. I like to keep the key’s major scale in mind and shift my thinking to play relative to the root of the chord. For example, if you are in the key of G major and a B chord is being played, I would focus my playing as if B were the root while the B chord is being played. You don’t have to start on the B to play a mode, but it likely played. Since the B chord, would be formed by every other note starting with B, you can find the chord tones easily (B-D-F#-A for Bm7)! I hope this helps.